The Golden Gate Bridge, Highway and Transportation District (Bridge District) will hold the first public meeting for the San Rafael Transit Center Replacement Project on Tuesday, March 20, at 5:30-7:00 PM at Whistlestop to talk about the future of the San Rafael Transit Center (SRTC). 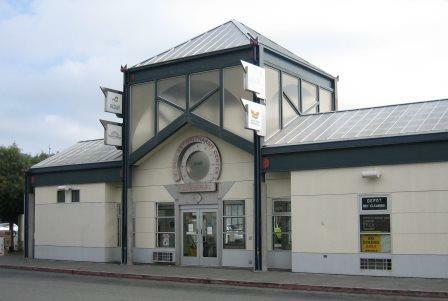 Whistlestop is located at 930 Tamalpais Avenue in San Rafael. The public is encouraged to attend the meeting to share their input about experiences at the current center and to help shape the vision for the new transit center.“While the existing transit center has effectively served expanding transit service and ridership since its opening over two decades ago, the construction of the SMART Phase 2 extension from San Rafael to Larkspur changes the transit center’s capacity, providing a significant opportunity and need to improve operations,” said Bridge District General Manager Denis Mulligan. “This is the start of a multi-year process to develop a replacement transit center for San Rafael. The Golden Gate Bridge District looks forward to public involvement in the process every step of the way.”A new transit center offers an opportunity to provide an improved experience for users; facilitate transit connections between buses and trains; and maintain or enhance the current functionality and flexibility for the operators who serve it.The San Rafael Transit Center serves as a regional transit hub for Marin County. It connects bus service, airporter service, taxi, and rail service with transfer points to San Francisco, Contra Costa and Sonoma counties. Services at the SRTC include local and regional bus service: Golden Gate Transit, Marin Transit, and Sonoma County Transit; airporter service via Marin Airporter and Sonoma County Airport Express; Greyhound Bus Lines; taxis; and Sonoma Marin Area Rail Transit (SMART) regional rail service. Currently, the SRTC serves the community by providing a 17-bay bus transit center; a connection point for over 500 buses a day for people to step on and off buses 9,000 times a day.The City of San Rafael, Golden Gate Bridge, Highway & Transportation District, Marin Transit, SMART, and the Transportation Authority of Marin (TAM) recently finished a Relocation Study, which proposed and analyzed near-term and long-term solutions for the location and operation of the San Rafael Transit Center, accounting for the addition of the SMART project.This project, the San Rafael Transportation Center Relocation Analysis, Environmental Clearance, and Preliminary Design, will build upon the efforts of the previously conducted Relocation Study to define feasible alternatives, solicit and integrate community feedback, identify a preferred alternative, obtain environmental clearance, and advance the project through the preliminary design phase. The current phase of the project is to obtain community input to help shape the potential alternatives for consideration.As owner of the transit center, the Bridge District will serve as the lead environmental agency for the project. The Bridge District, Marin Transit, TAM, the City of San Rafael, and SMART are all partners in the project.Funding sources include: One Bay Area Grant Program and Bridge District funds.There will be a number of community meetings and a variety of ways to offer input and stay connected. More information can be found at http://goldengate.org/SRTC. The online survey can be taken at bit.ly/SRTCEnglish. Connect via social media on Golden Gate Transit’s Facebook page and on Twitter (@GoldenGateBus). Sign up for e-mail updates on the GovDelivery website.